Today I was trying to install Ubuntu. I shrink space for "ext4" and "swap area" and I failed to install Ubuntu (11.04). I thought space I shrunk was not enough so i tried to shrink more space and I could not shrink anything from C: ( Cause it had system files which were unmovable ) so I deleted all volumes and there was a volume which was not deletable on windows (when i right-click on it there appears a pop-up menu with only "Help" choice , no "delete volume" choice ) it was not problem to delete that volume in Ubuntu . It was not problem till I installed Ubuntu successfully and tried to install Windows 7 (So i think that the problem is in that undeletable volume). When I tried to install win 7 I was having message "some drivers missing"(not exact message) and advancing by clicking next asks for some "*.INF"(Setup Information File)(not .INFO as in title) file which is DRIVER which I have no idea about it. Please someone Help finding this driver !! For starters, why do you want to run an older version of Ubuntu? You should be installing Ubuntu 12.04.1 LTS (Long Term Support). - click on 'Install Inside Windows' & follow the instructions. I use 11.04 cause i can't use g++ in 12.04 ( i have tried 12.04 and it's perfect ). but now i know how to install package g++ . Is "Install Inside Windows" available in 11.04? How can I manage drivers without having any OS? Or did you mean firstly create NTFS partitions and then delete Ubuntu or Am I able to manage volumes while installing Win 7? When I try to install win 7 I don't see any VOLUMES? I have made new partitions which are formatted as NTFS in Ubuntu but it still does not show any volumes which I should install Windows to and asks for some *.INF file. Like I said, completely wipe the HDD & start from scratch. Remove ALL current partitioning, create new partitions, format using NTFS, then install Win7. After Win7 is installed, install Ubuntu using the built-in WUBI installer (that's the method I described above). WUBI = Windows-based UBuntu Installer. When using WUBI, Ubuntu gets installed as a Windows program, just like installing a game, office program, anti-virus, etc. It doesn't need a partition of it's own. You simply select the size of the dedicated Ubuntu folder (in GB) at the start of the installation. And if you don't like the way it works, all you need to do is go to Control Panel > Programs & Features, then uninstall it. 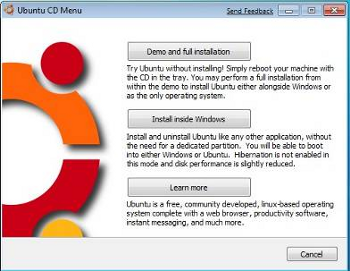 Ubuntu has incorporated the WUBI installer since verion 8. › No driver for Canon D860 MFC For Win7 64-bit? I've solved my problem. All I needed to do is to burn Win 7 to another cd and at x1 speed. ANYBODY WHO HAS THIS PROBLEM do it even the cd works on another computer. Cause the cd I was using previously worked fine on another computer.